Relocation of your office is not a matter to be taken lightly. If not planned and executed properly, it can cause quite a lot of headache and severe disruption for your business. Think about looking for a single file or document in a sea of unlabeled boxes and you would be able to imagine the stress that companies sometimes face when having to move to a new place. Fortunately, you are not alone in this. With years of experience in the moving industry, Charlotte Ang, the Operations Manager at Rentalorry would like to share some tips with you. From renting a truck to how your items should be packed, she has everything down to a science. 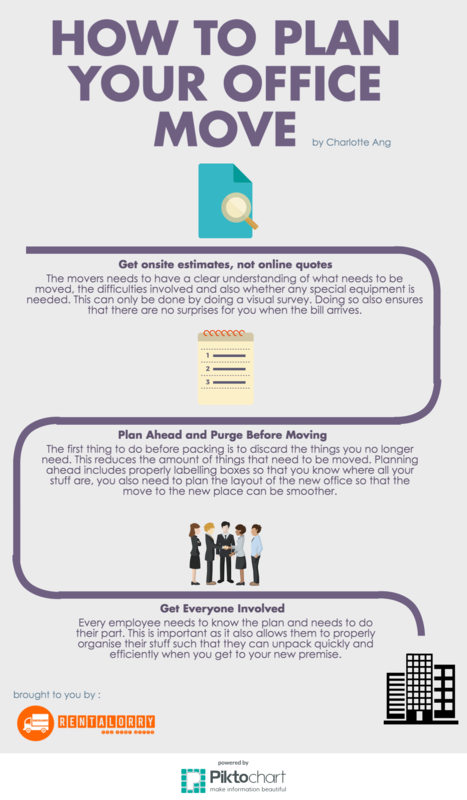 Check out these tips now to make moving a less stressful process for yourself and your company. Your moving company needs to have a very clear understanding of what needs to be moved so that they can properly plan and execute the move. In order to do so, they need to be able to visually inspect the site. Only from there can they decide whether any additional manpower or special equipment is required. Moving companies will normally be very happy to do an onsite inspection and will normally do so for free. By requesting them to do an onsite estimate, you will also save yourself from any unwanted surprises when the bill comes. The best way to reduce your moving costs is to first discard the things you do not require. From old desks and chairs to even cabinets and computers, these items can be donated or sold-off. Based on our experience, these has helped companies saved quite a bit of money off their initial quote. Plan ahead to see what equipment your new office requires and what equipment it doesn’t. Excess equipment like extra copiers can also be returned to the leasing company. Planning ahead allows you to get your things organised into the appropriate boxes and this is important for unpacking at your new premise. Properly label and tag your boxes so you don’t have to search through mountains of boxes to find the documents you need. Important information that should be found on the boxes include place where it should be stored in the new office and the name of the documents it contains. This point although quite simple is often overlooked. A few months before the move, all employees should be briefed on the plan. This is so that they can prepare their personal belongings as well as start organizing items and files from their own department. Smaller but important items may sometimes be overlooked by planners and involving everyone from the office helps to prevent this. Proper research, planning and getting everyone involved is the key to making the office relocation a smooth one, and this minimises disruption to your business operations. Follow these few tips and you are on your way to a better office move and saving some money along the way. If you do require some advice with your office move, you can also contact our office movers at Rentalorry. We have a team of experienced and qualified movers that can help reduce your moving burden.